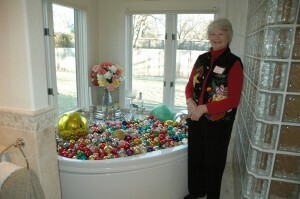 Creative decor and inspiring architecture await visitors inside the seven homes on the Holiday Home Tour this year offered by the Gillespie County Historical Society. Tickets are now on sale through the Pioneer Museum for both the Home Tour (Dec 3) and the Tannenbaum Ball (Dec 10). Supporters of Fredericksburg’s Gillespie County Historical Society can now reserve tickets for both the Holiday Home Tour on Dec 3 and the Tannenbaum Ball on Dec 10. The Holiday Home Tour features seven unique properties festively decorated for Christmas. The homes will be open to visitors from noon to 6:00 pm, and volunteer docents will explain features of each home’s furnishings and interior design. Homeowners opening their homes for the tour are: General Mike and Silke Hagee, Eric and Jennifer Bryla, Tom and Janice Christofferson, Danny and Jill Elliott, Chris and Kelly McDaniel, Mark and Susan Wheeler and Hugh and Becky Reeves. Tickets for the Home Tour are $25 per person and include tour booklet and access to each property. On the following Saturday, December 10, guests can enjoy the Tannenbaum Ball with the theme of a “German Christmas.” Guests at this exclusive evening will enjoy a catered three-course dinner, entertainment by The Flying GTs, a live and silent auction. The ball takes place at the Pioneer Pavilion at Lady Bird Johnson Municipal Park. Individual tickets for the ball are $100. Attendees may purchase underwriter table reservations that seat ten persons ranging from $1,500 to $10,000. In the weeks leading up to the Ball, patrons may purchase tickets to win a natural blue sapphire with “custom design” mounting – a $2400 value – through exclusive arrangement with Segner Jewelers in Fredericksburg. Prize tickets are $5 each or 5 for $20. Tickets for both the Holiday Home Tour and the Tannenbaum Ball are available online at www.pioneermuseum.net or by phone at 830-997-2835. Purchasers can also pick up Home Tour tickets at Gastehaus Schmidt, 231 West Main St., and at the Pioneer Museum offices, 312 West San Antonio Street, Fredericksburg, Texas 78624. Tour tickets are available up to the day of the event. Ball tickets should be purchased by Dec 6. The Home Tour and Ball are the largest fundraisers for the Gillespie County Historical Society, with proceeds going to the support of the Pioneer Museum. Tickets can also be purchased online during the reservation making process on the Gastehaus Schmidt website.